This book isn't perfect, but I'm still giving it 5 stars because it provides a better overview of the entire field of Machine Learning than any other book I've come across. My background is in computer science and software engineering and I've been interested ML as more of a hobbyist and outside observer for a few years (reading some books, taking Andrew NG's coursera course), just recently dabbling in some applications professionally. What I was still missing before reading this book was as high a level understanding of where all of the models and technique in the field of ML fit. Other books describe the difference between supervised and unsupervised learning, but this book goes further in describing how, say, decisions trees, support vector machines and deep neural networks fit compared to each other and within which subfields statistics play a larger role than others. The book also puts many techniques in historical perspective that I found very helpful, such as the rise, fall and rise again of deep neural networks with support vector machines taking a lead as the hottest technique in between (while also making clear that SVMs are a useful technique with unique strengths today). Finally, it makes clear that these techniques are not all competing for being the best overall at everything, but that they can be used quite complementary and/or they have unique strengths within certain problem domains. The book accomplishes all of this through a survey of broad subfields of ML, how each has attempted to be *the* master algorithm, has fallen short in some ways, but remains the best at some things and could play a role in the state of the art master algorithm (while acknowledging we're not quite there yet). 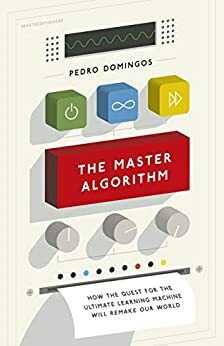 So while the term 'master algorithm' is somewhat of a gimmick (as he acknowledges), it's a good way to think about what ML is attempting to accomplish as a field: building working, adaptive software systems with less and less human assistance by learning from data, and to see how many specific techniques have played a role in progress. What I don't know is how accessible this book might be to someone who's less technical. I think the first couple chapters would be a great read for anyone with a general interest, making clear how ML differs from the traditional software / automation that has brought us so far, but it could be that the details within the rest of the chapters that go into more depth would be too in the weeds. I've also read some other reviews from technical readers that assert the book lacks enough depth to be helpful, but this wasn't the case for me, in fact the level of detail was perfect—just deep enough to match with details I'd skimmed before in previous surveys of the field yet not so deep that I couldn't get through and enjoy the chapters in a casual evening read. The author also explained some concepts better than I've read anywhere else before, such as the debate is between frequentist and bayesian statisticians. The Master Algorithm is a reasonable overview of the growing field of machine learning. The author explores the idea of there being a master algorithm which could explain everything given enough data. The idea seems a bit over the top when initially phrased but the real purpose of the book is to introduce ideas used in machine learning and how they work and are used to solve problems. The book is split into multiple chapters which start from discussing abstractly the master algorithm and then move on to some of the philosophical issues associated with using such algorithms. In particular the author discusses at the core of believing in pattern recognition algorithms is belief in inductive reasoning. The author discusses human learning and gets into some neuroscience and how neural networks are constructed. The reader gets a vague sense of Hebbian learning and how neuron weighting are at the core of neural networks. The author spends a lot of time discussing various approaches in machine learning and gives the reader an intuitive feel of Bayesian learning. The author was an originator in a particular algorithm called naïve Bayes which greatly simplified solutions to certain problems and so the author introduces his ideas to the reader. Other machine learning ideas are introduced like genetic programming and multivariable regression. The author also discusses other machine learning algorithms which turn data into a vector and then look for close neighbors of the vector to classify the input. The author also spends some time on how unsupervised learning would look. The book combines computer science ideas and intuition and tries to use a fictitious robot as the means to convey ideas about how a computer would learn. The author finally introduces his own master algorithm called alchemy which combines most of the models described in the book. The reader really gets little actual sense of what's going on in the algorithm as the author qualifies one needs a PhD in computer science. The Master Algorithm is the first book I have seen which introduces some of the ideas being used in machine learning to a general audience. It does so quite well and most of the ideas are absorbable. At the same time there are a few too many instances where the author is self promoting talking about all of the brilliant ideas he has had which have reshaped the field and how other areas of AI research of the past or Kurzweil and his singularity concept are idiotic. Despite probably being right in much of his analysis its arguing with no one on the other side and unproductive. Also the flavor of the writing is odd - it turns into some fantasy literature at times as though that makes the subject more digestible and in fact makes it more irritating. I enjoyed reading aspects of the book and do think the parts on what different schools of machine learning focus on are well written for a non expert, unfortunately there are many other parts of the book which one wants to get through as quickly as possible. This is a great book and covers everything but this book is certainly not for someone without prior knowledge of machine learning and good understand of some principles. At the start of the book, Pedro mentions that this book is written for the layman but it's not. I gave this book to a friend of mine before I read it and he was like "doode this is not for laymen, I didn't understand a thing". While the book is great for seasoned programmers and those starting with machine learning and good knowledge of some concepts, this book ain't for someone who wants to know more about machine learning and algorithms. I still give it 5 because Pedro is a great guy and this book is indepth.